Travel again on Wednesday past. I had to go to Iowa for business. My work was on Thursday and Friday so I left Wednesday afternoon. 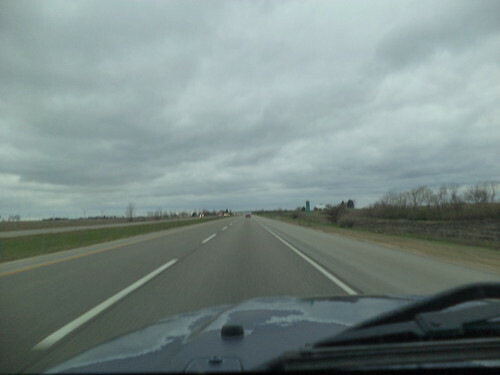 One of the fastest ways is to head west on Interstate 88. As it entered into mid-western Illinois, it dawned on me. Look at the clouds and the ground. This could pass for November. Seriously. The grass is not that brilliant green we associate with late spring and in November, it's not totally brown yet. The trees have not leafed out and could pass for having lost all their leaves. And that sky. Sigh. Low clouds holding spits of rain, just like the cold November rains which are precursors to snow. Add to the fact that it was only 50 degrees and it really could be November. We can be forgiven for thinking that summer is never coming, that winter just will not give up. In Iowa, Thursday, May 1st started with 2 inches of snow on the ground north of where my mother lives. It feels as if I will be running with the heater on until the end of June when it will suddenly become 90 degrees and my air conditioning unit will go, "What? Turn on? Fat chance." What a way to end a month of photos. I will continue this into May. Maybe there will be sunshine photos instead of gray clouds.